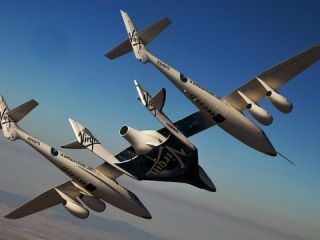 Virgin Galactic has announced it is looking for some Pilot-Astronauts to fly its Virgin Galactic WhiteKnightTwo and SpaceShipTwo shuttles. As it's pretty much everyone's childhood dream to become an astronaut, there's no doubt that Virgin will be inundated with applicants. But before you send yours off because you've been on a Virgin plane and that basically counts as relevant experience, the job description does state: "prior space flight experience is an advantage". In all there are three posts available, with the job ad explaining: "Reporting to the Chief Pilot, the Pilot-Astronauts primary responsibilities are to operate the spaceflight system in accordance with government regulations and company policies and procedures, delivering a sub-orbital spaceflight service to Virgin Galactic Customer-Astronauts which is as safe and enjoyable as possible." Oh, and shooting down aliens if they get too close to your vessel. Unfortunately for us Brits, you have to be a US citizen to apply, as well as hold a pilot's license and have a degree level qualification in a relevant technical field. You also have to be a "team player" – so single-minded spacemen need not apply.